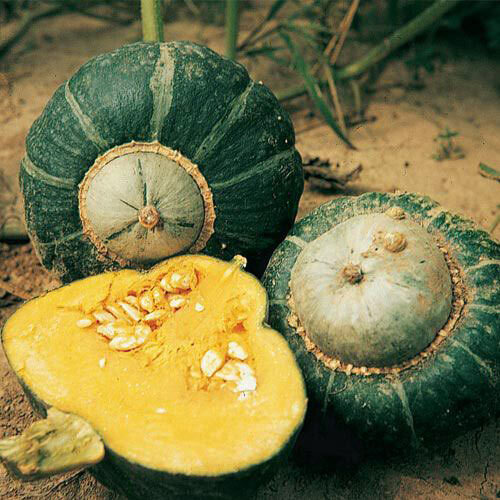 Buttercup Winter Squash | Gurney's Seed & Nursery Co.
Turban-shaped fruits weigh 3-5 lbs., heavy with yellow flesh. Thick and meaty, they are a treat to eat. Cooks and stores well. 105 DAYS. Spacing2 plants per hill. 8 - 10 feet between hills. FruitThick, firm, dry, golden-yellow, sweet, fiber-free flesh. Seed CountApproximately 25 seeds per packet, 1 oz. is approximately 250 seeds, 1/4 lb. is approximately 750 seeds. CommentsExcellent keeper. Turban or drum-shaped. Dark green with gray flecks and silvery white stripes, smooth, tough, thick skin. One of the tastiest Winter squashes. Size4 - 4.5 inches X 6 inches. 3 - 5 pound fruits.